Rustic elegance at the Myth is affordable. 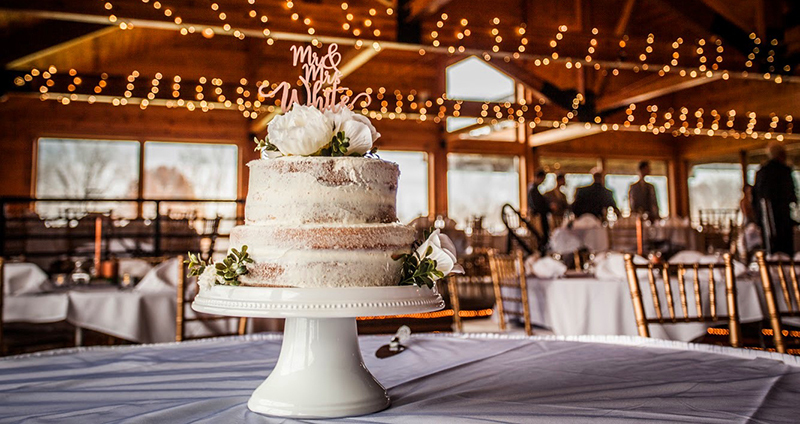 The Myth rustic wedding venue is the only one of its kind in Michigan. 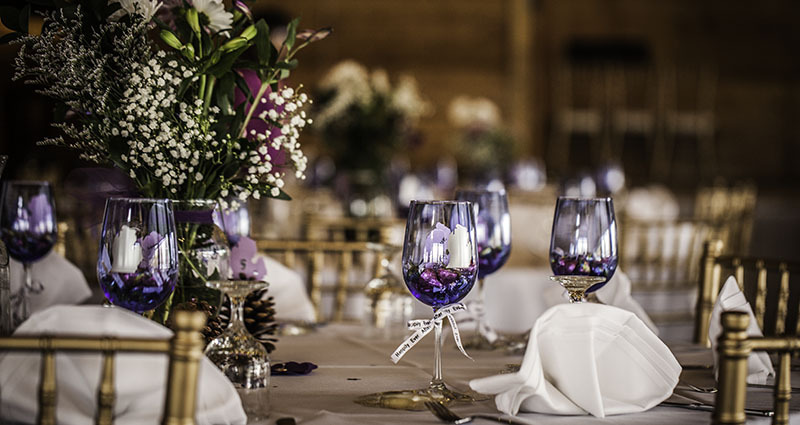 Our basic wedding package includes a beer, wine and mixed drink bar and buffet. See the wedding menu in detail to add plated and family style options, appetizers and much more. The Myth lets you build your own wedding package to fit your unique style. Take a look at our award winning menu with banquets open year round. 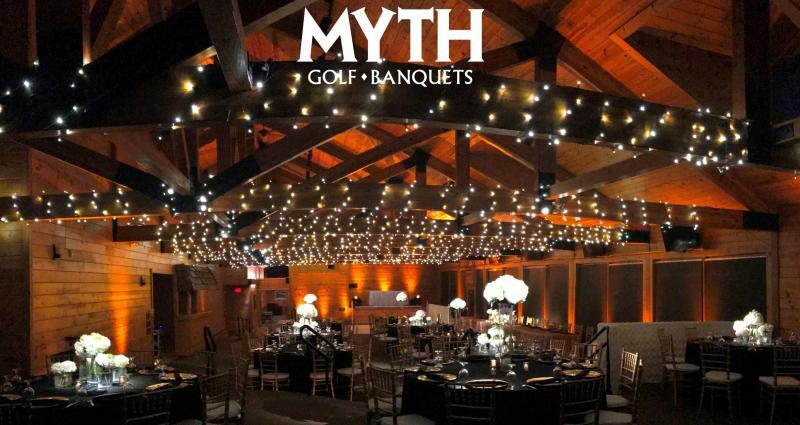 Myth has the look of a barn wedding but it is a clubhouse. 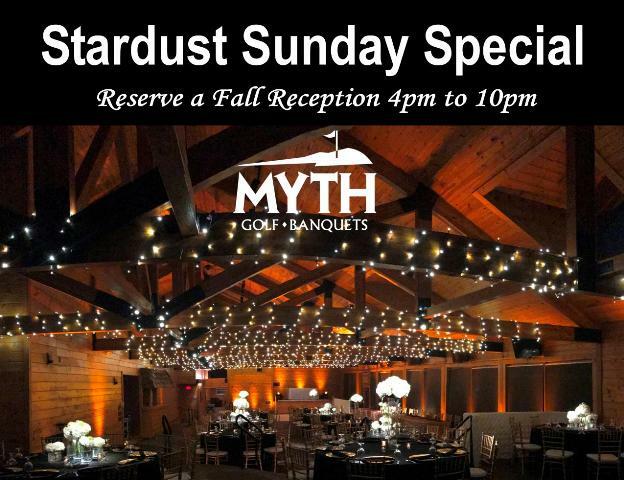 The Myth barn like wedding venue has openings on Friday, Saturday. and Sunday. Call Laura at 586-651-2781 to get a quote and set up a tour before dates are gone! To really save on your wedding venue, book a spring or winter wedding! 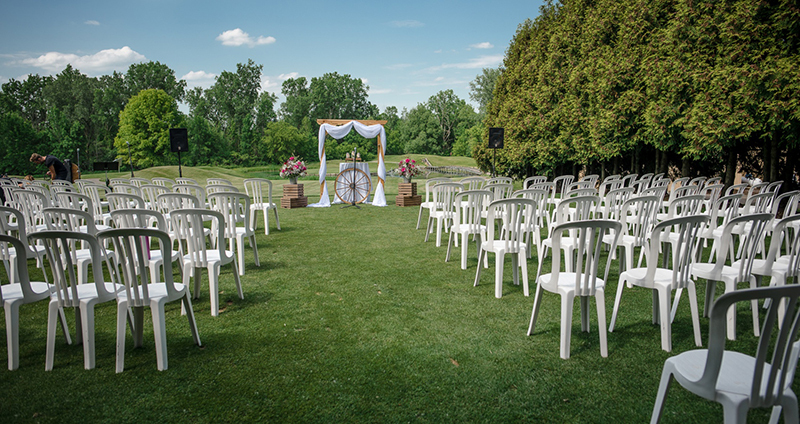 One of the most popular wedding venues located in Oakland county, Myth has an amazing rustic barn wedding look in the center of a golf course. The Myth Clubhouse is fully air conditioned, staffed, and has an award winning onsite chef. 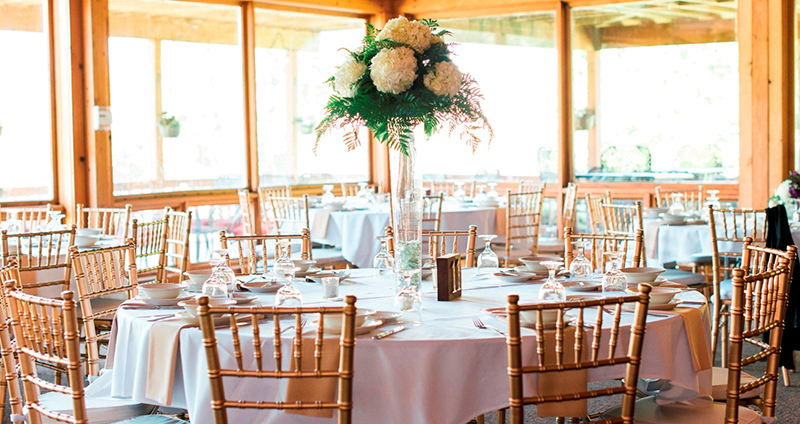 We Feature wedding receptions, outdoor wedding ceremonies, showers and wakes. Welcome to the most romantic wedding hall in Michigan! Winter weddings are a specialty for the Myth. The charming ambiance with windows and wood combined with floating snowflakes plus discounted rates give great reasons to choose winter. 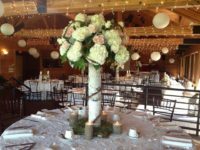 Save on wedding receptions at this rustic wedding venue this winter season and next! Call 586-651-2781 to speak directly to Laura availability regarding open dates! The Myth wedding venue also holds Easter brunch and Mother’s Day Brunch every season. See our menu for the Easter brunch or Mother’s day brunch on their designated pages. Call us for Easter Brunch or Mother’s Day Brunch near Rochester, Romeo, Lake Orion, Auburn Hills, Clarkston, Oakland, and Oxford. 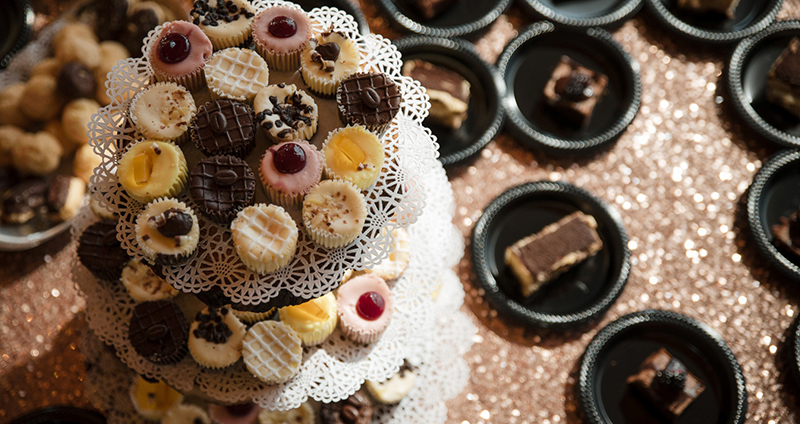 Our banquet hall is able to host events including bridal showers and baby showers, wakes, holiday parties and more. Our menu has soups, salads and sandwiches, hot entrees, and more. Try our trendy breakfast package featuring made to order omelets! Our trained and professional staff makes sure your event runs smoothly so you can enjoy yourself. Call us for your large events. Myth can hold up to 225 guests. Myth Golf and banquets is managed by Vargo Golf Company which has several popular wedding venues for your summer or winter wedding! We are located on the border of Oakland and Macomb County in Michigan. The Myth Wedding hall is surrounded with panoramic windows and an attached outside patio. 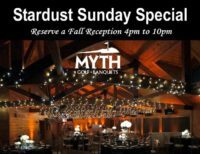 Myth is a rustic banquet hall and is voted one of the most romantic wedding venues in Michigan.